In the Peruvian jungle icaro is the name for the song or melody used by the curanderos (most commonly used term to describe healers) in their rituals. Lacking a literal translation in Spanish, Quechua, or other regional languages, in practice it has a very deep and important meaning: the shamanic song is a tool that cures, the wisdom and the vehicle for the curandero's personal energy, the symbol of his power. Using the 'icaro' means 'charging' an object or potion with the power of the shaman, conferring upon it a specific property to be transmitted to the recipient, be it purification, protection, curing, harm or influence over the will-power. This is done by singing the icaro directly over the transmitter object or substance. The object is then given to the subject and ingested in the case of liquids (potions) or smoke blown over him if tobacco is used. The icaro is fundamental to the curandero's work in the Amazon. It embodies the knowledge of the shaman, constituting his curative patrimony, his working tool, and the inheritance of his apprentice. Being the vehicle for his energy, its effectiveness depends largely upon the curandero's preparation through diets, the taking of purges, his daily regimen and assimilation of ancestral knowledge. A 'maestro' neither transmits 'techniques' nor formal instruction to his apprentice but rather accompanies and guides him to gain that knowledge for which he is preordained. As part of the training he passes on 'his' icaros. Every shaman is the owner of his icaros, just as he is the owner of his own experience and wisdom, having received them from his 'maestro' or directly from nature. Curanderos commonly state that the things they know, including icaros, they learnt in dreams or visions that they were given by plants. They recount that in those states of consciousness induced by plant teachers ('plantas maestras') they learnt the melodies without effort or reasoning, feeling instead that the melody manifested itself and often in an unknown language. Generally at the moment of curing, it comes to him in the same way. Neither the words nor the understanding of the text of the icaros are indispensable. What is important is that the curandero feels and shares the spirit of the icaro. If he really identifies with his icaro he will know when, how and with whom to use it. The icaros used by the shamans have very simple words, alluding to certain plants, animals, and local environmental phenomena possessing power or symbolism. Nowadays, many icaros contain Christian syncretisans and biblical allusions. Most of them are written in Spanish, Quechua or other dialects, according to the backgrounds of the original maestros, though some are only monochord melodies and very repetitive. A maestro neither transmits techniques nor formal instruction to his apprentice but rather accompanies and guides him to gain that knowledge for which he is preordained. As part of the training he passes on 'his' icaros. How do icaros work? One might say, as with the Matras of the oriental tradition, they act upon certain energy centers through sound vibrations, modulating organic functions and that subconscious knowledge guides the shaman to choose the right icaro for each situation. 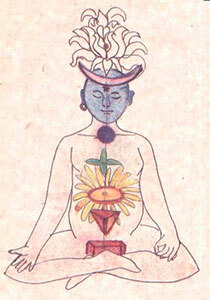 Or one might say that the icaro is a pretext for the shaman to transmit his energy. Or that it is the message transmitted in the icaro that cures. There is no precise answer; it may be reduced to one or all of these. Any explanation in rationalism a phenomenon which transcends the rational and as such would only be valid subject to testimony and personal experience. My commitment to a process of personal, first-hand exploration has led me to experience various shaman 'techniques' and I would like to testify to the value of the icaro, in spite of my training as a medical surgeon. It is impossible to practice in this part of Peru without taking account of the rich variety of Ancestral Medicines, since each case and each patient brings new valid information. However, we must modify our culturally based view and learn to see in a new light the relationship between man and the natural world, accepting that despite the lack of a rational explanation for this, each and every person possesses medical abilities. In some this manifest spontaneously and may be developed or 'unblocked' through work on the body: Principally the curandero uses his body and his energy for curing. My first encounter with the icaro was seeing how the "curiosos1" or the grandparents blew "icarado" tobacco smoke or perfume2 over the energy centers of nervous or frightened children or those with windpains, with favorable and immediate results. Later I learnt (and experienced) that this also works with adults, producing a sensation of relaxation and reducing symptoms in the autonomic nervous system. I have also had the opportunity to observe how two mothers with breast feeding babies suffering from miases (fly-larvae in the tear-glands and in the mucous membranes of the nose, respectively) used a monotonous whistling, similar to that produced by the adult insect to make the larvae emerge through the orifice through which they entered. In both cases it worked. In the town of Chazulta, well known for its shamans, curandero Reninger Guerra Flores is famous for treating venomous snake bites: he uses icaros to calm the intense pain. It was during a session with Ayahuasca (curative ritual involving the ingestion of a psychoactive potion composed of Psychotria viridis, Banisteriopsis caapi, and Brugmansia sp.) that, under the effects of this brew, I began to understand the internal significance of the icaro. I should point out that despite having a psychoactive effect of increased perceptions and visions, you do not lose touch with reality and memory. The narration of the visions is important to explain the order and meaning of each icaro that I have received. The content and terms express my personal and cultural background since they manifest and act through me, moving energies and personal blockages and forming part of an evolutionary process which has completely enveloped me. It has not been a linear process. It has taken time and I have had to pass through thematic cycles following the stimulation of each energy center. This has not been influenced solely by Ayahuasca but also by other depurative plants, diets, fasts, plant baths, purges and dream activity. The first vision (which repeated itself several times before I realized it was an icaro) was a small green plant-woman who appeared from the bottle containing the potion to guide me on my path of self-discovery by singing and dancing. The melody she was singing was an invocation of the 'mother' of the plants: 'Mother Ayahuasca'. This 'mother' of plants, according to the curanderos, is equivalent to the soul or spirit in human beings. It has taken me a long time to dare to sing these icaros: I did not feel that they were mine to use. I have experienced a battle between the denial of my rationality and the acceptance for my deeper I. The more I rejected them, the more the icaros manifested themselves through recurring dreams, physical discomfort and tension. Finally, I have accepted these icaros, a gift from the plants and from life. After various sessions of visualization and activation of energy centers, manifesting physically as tingling or heat, a certain vision began to repeat itself: one of colored geometric designs which represented at once a natural form, a symbolism and the sound of vowels. But the vowels were not five, as in our alphabet, but seven with the inclusion of the letters 's' and 'm'. I understand that each center had a corresponding icaro-key which I would be given. In two years I have received six icaros at irregular intervals, without premeditation of their contents or order, always unforeseen and without voluntary participation. They have come through visions, dreams and semi dream states produced by diets and rituals with plant teachers. 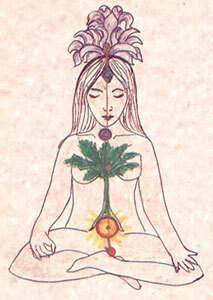 The second icaro corresponds to the base chakra (meaning energy center in the Hindu tradition) relating to sexuality. It is the letter 's' and is a small red snake of fire which rises, slithering slowly towards the abdomen and sacral area, seen in three dimensionalities, as if the body were transparent. It relates to vital energy, the ascendant force, rising from the earth, rising towards the sun. Meanwhile I am listening to the icaro of the 's', sung by the little plant-woman hissing, gently dragging out the 'sss' and I see the other participants in the session with a red glow at their base. Although the voice comes from within me I do not recognize it as mine. In ascending order, the second chakra, the intra-umbilical, corresponds to the letter 'm', which I visualize solid, well-grounded, concrete and material. I feel that the sound must come from the belly, cradle of instinct. Of fear, of life and of death. These two letters may activate the first two centers corresponding to the primary instincts. Higher up, the column of light which was orange at the second chakra, becomes green and is a tree which spreads out into the chest. I become conscious of my breathing which has a pleasant depth to it. It is the letter 'a', the bucal opening which protects us and permits us to take in air, to grow, to distend the respiratory tree, open the consciousness, memories and the soul. The energy circulating between these two points (intra and supra-umbilical) forms a luminous arc rotating on the horizontal plane and this is the yellow sunflower-sun which corresponds to the solar plexus. This center activates protective mechanisms and holds within it the capacity for gaining profound self-knowledge, for sadness and for happiness, for emotions, for curing and for the communication, without words, of profound feelings; as profound as the sound of the letter 'u'. Rising above this point, we reach the letter 'o', line without beginning or end, representation of the fundamental, eternal cycle, the 'Ouroboros'(italics), or heart center. This is the seat of the greatest curative power which is Love, represented by a violent sun, and abode of the intuition. The letter 'o' is a circle bearing all the symbolic significance of its shape. The letter 'e' corresponds to the chakra of the forehead. It allows us to 'listen', not just to clearly capture sounds but to 'understand' the message from our bodies or surroundings and to profit from it. Finally we come to the superior chakra related to the letter 'i', standing for Infinite, Immensity, Interior, Illumination. Its corresponding icaro can help us to 'see' inside forms with more intensity and light and above all to discern, to see the importance and to integrate the image with the whole, with a universal vision; to see in another dimension, with other eyes, with more transcendence and to live fully each moment. I have not yet received all the icaros. I do not know if I will receive the whole series, nor when nor what will come later. Neither do I know what subconscious mechanism could have brought me these nor if they really work. I have to leave the rational framework and admit that these are a series of interesting unknowns without explanation. Deeply buried within each and every one of us is a knowledge of life, hidden away and estranged from our conscious by an excess of external stimuli and the misuse of our bodies. Given the right conditions, this knowledge can come out unexpectedly, illuminating a path which we have never seen before. Lying on the ground, with my whole body in contact with Mother Earth, coiled around myself, feeling my skin...slithering along, feeling the grass, the damp, textures pressing against every little bit of my surface, listening to the distant whispering from the bowels of the Earth, centuries old, voice of the desires of the flesh, long, big, cold, protective and sensitive, stimulating and awakening embryonic sensations, remembering snake-memories from other times and places. Neither rejection nor abomination, so I was not the accursed and persecuted creature to whom all evils are attributed...curled up in me and in Me, I was recognized and respected...on crowns and thrones, on the arms and at the feet of gods and mortals, in poems and songs, coiled around the staff of Mercury where the winged sun crowned me, solar knowledge known by the moon which lights up and reflects the curative capacity of my power; on the heads of the goddesses, holding up the moon and giving them dark strength...waking in the East, fire red, hissing and angry, feeling like the bearer of the red water of life, ascending the sun of consciousness...creeping slowly and silently, ascending sinuous and feminine, secretly, to sleep in the center of the eternal flower...seeking my mirror-image, split from itself, that will permit the complementary union that can transform me into infinity. Sure of myself, stable, feeling that I can connect heaven and earth, my strength is from below, the Earth sustains me, but I can rise and look down, through the timeless crystal blue eye, from the dwelling-place of all the serpents of every age, all of them, visible and invisible, terrestrial, marine, winged dragons, all of them, talking to man and man to himself, urging him to give himself up to the sacred, the deepest, to the transcendent and the impersonal. Suddenly, in the middle of the night, my rational defenses subdued, the mirror showed me my snakish nature, neither good nor bad, aggressive but sweet, a present and real vision... my snake nature. And she forces me to look at her, to understand her, to feel her free from mood judgments; there is no good nor bad only nature with both values, with undifferentiated duality of forces, without responsibility but not irresponsible, just existing... sometimes white, sometimes black with surprisingly innocent eyes in such a face, with breathing life and pre-destined. At once I understand the reason for the terror which the snake excites, the reasons behind the repulsion, the fear, the need to attribute negativity to her and to distance her and differentiate her from us. I have tried to find my serpent-being and awaken her so she can awaken me, to discover her in my body and mind and to feel my body and mind; to learn to hear the voice of the serpent that wants to tell me simple things about when the foot prints of man appeared on Earth, when he used to watch the skies, talk with the gods and with himself, and when he knew how to listen...to accept the serpent within in its entirety, with its good and its bad, to be united with her, with my dark and light phases...to begin to be. Sobre la cobra erguida se superponen, tan velozmente que la mente no puede controlar, las diosas antiguas en sorprendente metamorfosis, serpiente-sabiduría dormida en las profundidades de la memoria universal, arquetipo fundamental que trasciende las diversidades culturales en la noche; poder matriarcal de la tierra-madre reprimido por el culto de un espíritu inmaterial-materiófobo o de un materialismo vacío. Larga sucesión de diosas naturales, evolucionando con el hombre; la serpiente, la Luna, Tanith, Isis, Ishtar, Astarté, Minerva, Cibeles, Demeter, la Virgen María para el cristianismo, todas diosas con relación a la fecundidad (inclusive la virgen María cuya misión fue "encarnar a Cristo"), diosas mediadoras entre la voz de la serpiente-materia y el espíritu solar, y que portan atributos de la serpiente, sin embargo tampoco debemos olvidar que la serpiente es esencia, arquetipo dual, oposición de contrarios en uno, y que también hay en ella un aspecto sexual masculino-femenino asociándose a la imagen de Python, Apophis, Tifón, Satán, el Dragón chino o medieval, cargados de agresividad pero al mismo tiempo alados, con capacidad de elevarse, y la serpiente emplumada de Mayas a Incas. Superimposed on the coiled serpent, so rapidly that the mind cannot control it come the ancient goddesses in surprising metamorphosis, serpent of wisdom asleep in the depths of the universal memory, fundamental archetype transcending diverse cultures in the darkness: matriarchal power of mother Earth repressed by the cult of the matter-phobic immaterial spirit or by empty materialism. A long succession of natural goddesses, evolving with man: the serpent, the Moon, Tanith, Isis, Ishtar, Minewa, Cibeles, Demetria, the Virgin Mary of Christianity, all goddesses related to fertility (including the Virgin Mary whose mission was 'to incarnate Christ'), goddesses mediating between serpent-matter and solar spirit, all bearing different attributes of the serpent. However we must not forget that the serpent is essence, dual archetype, the opposites within ourselves and that she has within her a masculine-feminine sexual aspect associated with the image of Python, Apophis, Tifon, Satan, the Chinese or medieval dragon and the feathered serpent of the Manas and Incas, charged with aggressiveness but at the same time winged, able to elevate themselves. This being so, why is it that the Christian Virgin has the head of the snake under her foot, while for the ancient goddesses it occupied a place of honor (the crown of Isis, the arms of Ishtar, the breast of Athena). Is it that spiritual religion must crush the material, the telluric? If the Virgin is the intermediary between man and Heaven, is she not using the serpent for support, accessing ancient and transcendent knowledge through her contact with the serpent's head? This is not the fight between God and the demon, of Good against Bad, it is man fighting against himself, spirit-man against material-man, against his most instinctive tendencies not to accept his material essence. The serpent is not evil, what is wrong is the mistaken use of its power, its strength, the attempt to be pure spirit without cleansing the physical part, forgetting the serpent-body, wishing to acquire its knowledge while obviating the ritual, the sacred essence, the respect deserved by such fundamental and ancient knowledge...Only overcoming this can the true spirit shine and the serpent have wings to ascend to the sun, serpent-dragon of the age of alchemy and of the East, relegated to the shadows since the Enlightenment when true light was replaced by false and cold suns. Now I am one of several little snakes. I warm my body in the sun, enjoying the warmth and smell of the earth until a shadow eclipses the sun; my sisters flee, terrified, hiding under the stones. I fear the approaching bird too but my curiosity to see it close up is stronger than my fear. I know it has seen me and, paralyzed with anxious fear, I wait for it, eyes closed. The sensation of my body suspended in the air with the wind all around, the feeling of flight makes the fear and risk worthwhile. I see the Earth from where no snake has ever seen it...but...but I'm no longer a snake! In full flight I see that now I am a dragon embryo in an opulent egg reverberating with the light of the sun which is getting closer all the time. My terrestrial memory is left far behind me and I am filled by a feeling of complete freedom. Light, peace and beauty are all I see below in the solar field of sunflowers, no desires now except, of course, not to fall...I return to my bodily form once again and hear the gentle song of the wind interrupted by a growing noise: the sunflowers are being pulled out by the roots, moved by turbulent waters from which emerges the phallic head of a stone serpent. Terrified, I assume a fetal position. I feel the great strength of this timeless petrified serpent which awakens from its slumber in the depths of the earth, the depths of my subconscious, awakening fears, eliminating the little suns and standing erect before the sun-spirit as if to show that, though it may remain submerged, it can emerge at any moment and that its position is not in opposition to the sun but with it. On top of the snakes a cactus flowers and calm return to the scene. This little dragon knows how to fly now and can follow the eagle's flight. Now is the time to assume the serpent's choice, to be the winged serpent, to return to our human essence and to accept the duality of the serpent, to confront our serpent aspect and to use this to heal ourselves so that we can heal others. In this process, this polarized flight between instinct and reason, the serpent is there on both sides; we just need to learn to see it and to make the heart, home of the spirit, the meeting place for the two sides, home. Let us not forget that Medusa's snake-crowned head turned to stone when she saw herself in the mirror: reason cannot accept the instinctive and irrational as a part of itself without unification in the true spirit, composed of the three-dimensional unification of the Whole, which goes beyond Aristotleian thought, restructuring the being instead of pitting it against itself, giving it instead transcendence and space in the cosmos. It has now been more than five years since the night of the Ayahuasca session in which I had my first contact with the snake asleep within me. During this time, through dreams, visions (during Ayahuasca sessions), music therapy, diets with other plant teachers and physical perception in states of wastefulness I have deepened my understanding of the symbolism of the serpent. The path of self-discovery, the unending path, is unpleasant at times, surprising at others, but always exciting. I feel that this is an evolution in which we make contact with the deepest contents of our subconscious and that this is not just interesting, picturesque or esoteric but that it is a way to access real, coherent and healing knowledge once we consciously recognize as our own all the aspects of our deeper being. It is precisely this, the discovery of our dark sides, hidden by rational censure which enables us to accept ourselves in our true dimension and to work on ourselves to purify or potential our energy body and to use it to its full. Article originally published in Spanish: “Acerca del “Icaro” o canto shamanico”, Revista Takiwasi, Nº 2, Takiwasi, Peru, Año I, Octpber 1993 pp. 7-27. 1"Curiosos" is used autochthonously to describe a person familiar with remedies and medicinal plants (literally 'interested' or 'keen'). 2 Tobacco or perfume over which an icaro has been sung, to endow it with medicinal properties. 4 Phlegm which is materialized shamanic knowledge. It may be transferred by swallowing it. Picture 1 First vision on Chakras: Session of Ayahuasca, Puerto Maldonado, 1990. Location and characteristics of each energy center in my body. Picture 2 Vision of the circulation of personal energy and its relationship with different diseases, visualized as blockages or obstructions in the passage of energy. The fluid is of different color, according to each chakra. Picture 3 Vision about the body's medicating capacity, visualized as the interaction and complementarity of one person with respect to another and the use of the energetic fluid to "unblock" or free the disease. 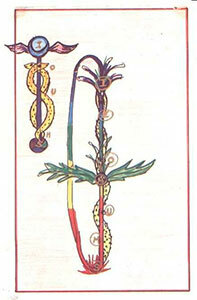 Visualization of the Mercury Staff, in which the two snakes have three points of union: the first chakra (flow), the third (solar plexus) and the fifth for physical health. These aligned points allow the ascension of the fundamental energy that will nourish and allow the lunar flowering of the flower of knowledge, that which never withers. At the same time, the symbol of infinity has been formed by joining earth and sky. (Drawings: Rosa Giove). Center for rehabilitation and treatment of addiction, retreats or diets in the Amazon rainforest, research on traditional Amazonian medicines.